Today I have a wonderful guest post by Cindy Sha from Steam Mop Reviews. She has some great tips and ideas on going green, which is perfect timing for those of you who have planned to go green as a New Year Resolution. Enjoy!! Going green is becoming widely popular. This is one of the few things that I would encourage popularity, simply because of its ability to drastically change our environment and help the world. The state of the earth is in poor shape- rampant pollution, high carbon emissions, toxic wastes, dying plants and animals and huge weather changes are just a few results. This is happening because of us and we can fix it. How? By changing a few of our daily habits, it can eventually add up and have a huge impact. You don’t have to suddenly make huge lifestyle changes, well at least not until you are ready to. If you follow a few of these tips, they will go a long way in our green agenda. Change your bulbs: Replace all your bulbs with CFL bulbs. These bulbs are initially more expensive, but they will more than pay back for themselves. They can last up to 10,000 hours, use less electricity and emit less heat. The result: a lower electricity bill and extra savings while reducing your overall energy consumption. Use homemade cleaners: Chemical cleaners have many negative effects on the environment. The chemicals within your detergents and cleaning solutions contain toxins that are reintroduced to the environment through our waterways or air. The result of this is air pollution and water pollution. Instead, you can use homemade ingredients like vinegar, baking soda and lime juice which can be used to clean stains, grout, toilets and various surfaces in your home. Reduce your consumption of copy paper: Instead of printing on one side of a page, make sure to print on both sides. This will instantly halve the overall number of pages you use. If you can implement this in your home or office, you will be making a huge difference in our paper consumption. This means an overall less demand for paper which decreases the number of trees that are cut down. Buy green cleaners: If you don’t want to use homemade cleaners, then you can simply purchase cleaners that are green and eco friendly. Instead of buying a mop which spreads chemicals around you floors, you can opt for a steam mop. It only uses steam to clean, but is very powerful and will disinfect your floors. There are also many certified green cleaning solutions to choose from which include the Oxy gen2 cleaning solution, Simple Green, Greenworks, Method etc. Carpool: You can share a car with your co-workers and even organize one for your kids and their friends. This will save on gas money while reducing the number of cars on the road. This means less traffic and less carbon emissions. It can even help you improve your social skills which are a great additional benefit. Turn off and unplug those electronics: This includes shutting down your desktop or laptop every night and unplugging all of your appliances. Once they are plugged in, they are consuming energy. By simply unplugging them, you will be drastically reducing your energy consumption. Green pest control: If you have a problem with pests and insects around your home, don’t turn to those toxic chemicals to get rid of them. Instead, you can try a few green or homemade solutions. If you have a lot of mosquitoes in your home, simply remove any stagnant water from around your house. Then, spray a solution of water and ammonia (lemon scented) in the affected areas. Need to repel insects from your plants? Simply mix a solution of 2 garlic cloves, 1 tablespoon cayenne pepper, 1 onion and a quart of water. Allow the mixture to steep for a few hours and strain. After you’ve strained the solution, add a tablespoon of liquid soap and mix thoroughly. You can now use this solution to spray on your plants to prevent insects from damaging them. The solution is good for up to a week and then you should make another batch. 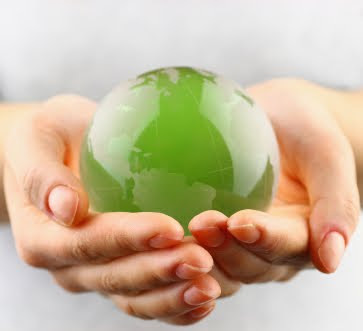 The above are a few simple ideas to get you started on a more conscious and green way of living. If we can all do one or a few of these, then we would definitely be on the road to change and environmental preservation. Cindy Sha is a writer who simply loves reviewing steam products. She writes steam cleaner reviews, steam mop reviews and sauna reviews to help educate folks on the amazing capabilities of steam.